The Daily Caller on Saturday, facing backlash, fired its opinion editor and canceled a weekly column he had offered right-wing provocateur Milo Yiannopoulos. 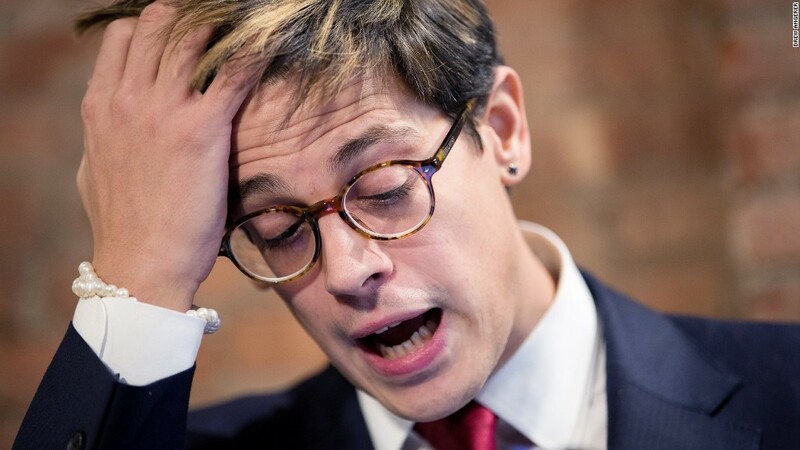 "Sad news: The Daily Caller has caved to pressure and cancelled my weekly column after a day, claiming, falsely, they never planned to run weekly contributions from me," Yiannopoulos wrote Saturday on Facebook, adding that he was "disappointed, to put it mildly." Just a day prior, the Daily Caller, a conservative news and opinion website, had published a column by Yiannopoulos on the topic of the sexual harassment allegations against actor Kevin Spacey. At the time, Daily Caller Editor-in-Chief Geoffrey Ingersoll told CNN the website approached Yiannopoulos for a column on Spacey because they "thought him particularly fit for it." According to Ingersoll, opinion editor Rob Mariani later struck a deal with Yiannopoulos for an unpaid, weekly contribution. A note at the bottom of his Spacey column indicated it was the "first installment" in a "new weekly column." The note is no longer attached to the column. The news of a regular column from Yiannopoulos did not go over well. The Daily Caller came under immediate fire on social media for giving platform to Yiannopoulos, a controversial figure associated with white nationalism who resigned from the right-wing Breitbart website earlier this year over comments he made about pederasty. Robert Mercer, the billionaire conservative donor, said earlier this week that he was "mistaken" to have supported Yiannopoulos and that he was severing ties. Internally, some people at the Daily Caller were also upset. One employee told CNN that several at the website were blindsided and unhappy with the news Yiannopoulos would have a weekly column. In response to all the controversy and media reports, Neil Patel, co-founder and publisher of the Daily Caller released a statement saying Yiannopoulos had not been hired by the website and "does not have a regular column with us." And on Saturday, Ingersoll fired Mariani, telling CNN in a statement that the opinion editor was let go for "failure to properly convey" the deal he made with Yiannopoulos to him and the website's CEO. Mariani told CNN the idea to publish Yiannopoulos's initial column was suggested to him by a top editor and that it was "met with enthusiasm" by Ingersoll. He added that the Daily Caller had published Yiannopoulos before and that he had "informed" management that he "got Milo on more than one occasion." "The fact that it was a higher-ranking editor's idea, the fact that I brought up the fact that I published Milo to the top brass so many times and the fact that we had already published him made it seem like a no-brainer," Mariani told CNN. Mariani said he was surprised to have been fired. "My traffic for the section was at record highs and increasing," he told CNN. "I was doing a good job and even just took on more responsibilities to help run the organization's new fact-check vertical."